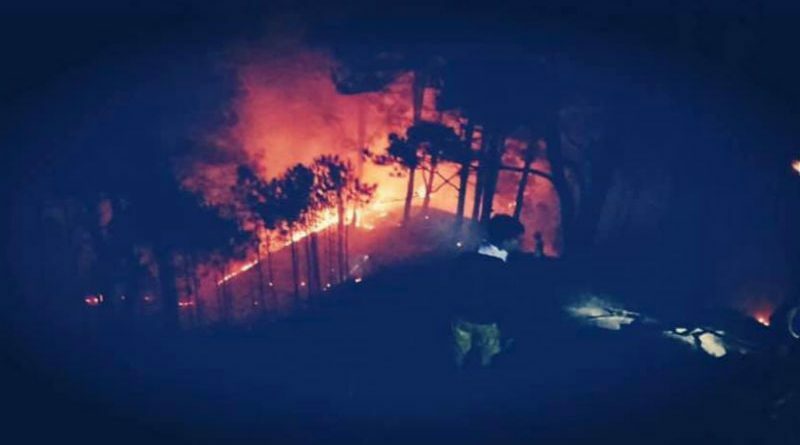 ITOGON, Benguet – Five people died after their bodies where charred by a forest fire that gutted over 25 hectares of a forested area at Eastern Saddle, Ampucao, here, Wednesday afternoon. Philex Mining Corporation president and chief executive officer Engr. Eulalio B. Austin, Jr. claimed that 4 of the fatalities are permanent and contractual employees of the mining company tasked to assist in the implementation of the firm’s environmental preservation and protection program while one of them was a retired mine worker who reportedly maintains a vegetable plantation area in the municipality. Police authorities identified the fatalities as Dante Molina, forestry supervisor of Philex Mines, Noel Degyem, Marlon Guiniguin, Dexter Labasan, all contractual workers of the company and Leon Mocate, a resident of Ampucao, Itogon, Benguet. “We sympathize with the family members and the relatives of the victims of one of the biggest forest fires that ravaged part of the company’s reforestation area. We salute the bravery had heroic act of the victims in trying to contain the fire from ravaging the school and the residential area that resulted to their untimely demise,” Austin stressed. The Philex official disclosed that the family members and relatives of the victims will be receiving the appropriate benefits and assistance that will be extended by the company pursuant to existing policies and regulations, saying that that forest fire was just one of the series of forest fires that continue to damage the company’s gains in the implementation of its reforestation program which is part of their efforts to sustain the environment of their tenement area. According to him, the victims responded to the area purposely to help put up a fire line, one of the strategies for fire deviation, to prevent the fire from further inflicting damage to the existing school and residential area above it but the strong winds from different directions caused the fire to ravage the area where they were situated that caused them to be trapped and eventually charred. Arson investigators revealed that the fire took over 12 hours before being declared under control allowing the conduct of mapping operations Thursday dawn. The recovered charred bodies of the victims were brought to the Sto. Niño hospital inside the Philex Mines where they underwent the required autopsy before their remains were turned over to their family members to be brought home for them to be given a decent wake and burial. Austin noted that the fire originated from below the company’s dam No. 1 and it reportedly spread to the other areas because the fire gutted dried debris and pine needles which were considered as highly combustible. The Philex president called on residents living in the communities near the mine site to undertake all possible precautions when lighting up a fire in their plantation sites to prevent the occurrence of similar fire incidents that will pose a serious threat to life ad limb. Part of the company’s environmental preservation and protection program is the propagation of trees around its mine site to help in sustaining the greenery of the area worthy of being passed to the succeeding generations of inhabitants. Photo by: BFP-CAR, uplifted from PIA-CAR facebook page.